In an elegant set of studies published in February 2016 in Nature Neuroscience the team of Bruno Giros, a researcher at the Douglas Mental Health University Institute and Professor of Psychiatry at McGill University, reports the first-ever connection between noradrenergic neurons and vulnerability to depression. The study involved research using probably the most well developed animal model for depression – chronic or repeated social defeat. In this model, mice are placed in a situation where they are repeatedly defeated by more aggressive strains of mice. Using this paradigm it is possible to distinguish between vulnerable and resilient mice. The vulnerable mice and up looking similar to depressed humans: they show evidence of fatigue, loss of motivation, and other symptoms suggestive of depression. By contrast, resilient mice do not show evidence that they become discouraged or depressed from repeated defeats. This model is thought to be analogous to resilience or vulnerability to depression from stressful life events, such as job loss, relationship loss, poor health, etc., In humans. 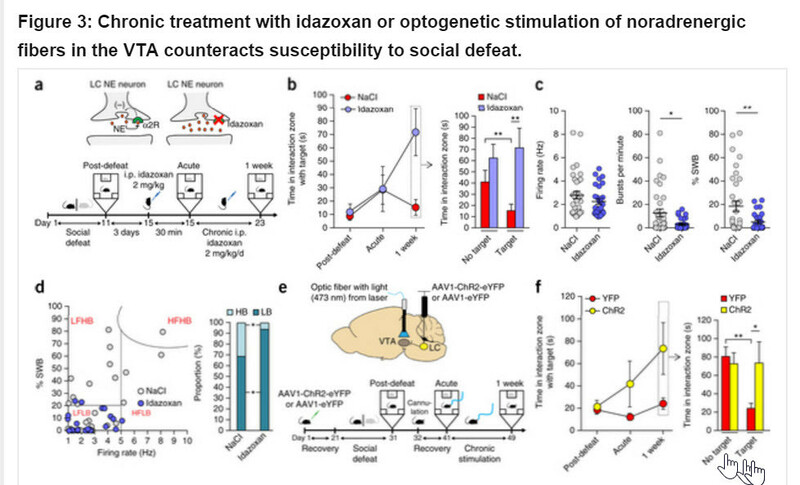 In the study, researchers were able to show that what distinguished resilient from vulnerable mice was increased dopamine activation in the ventral tegmental area in vulnerable mice. This had previously been reported, but they went further to see whether norepinephrine neurons projecting from the locus coeruleus to the ventral tegmental area (VTA) might play a key role in regulating dopamine activity. They found that the vulnerable mice showed reduced activation and gene transcription (c-fos activity) of the norepinephrine neurons in the locus coeruleus. They found a strong correlation between the number of activated VTA-projecting NE neurons and social interaction time, suggesting that both the activation state of VTA-projecting LC NE neurons and the amount of NE released into the VTA are critical factors in determining vulnerability to emotional stress. They studied mice with norepinephrine neuron defects and showed that these mice had a much higher rate of vulnerability to defeat (only 5% were resilient compared with 30% of mice without norepinephrine neuron defects – suggesting that norepinephrine neuron activity plays a very large role in resilience). They also showed that treating these mice with the α2 noradrenergic receptor antagonist idazoxan, and the norepinephrine reuptake inhibitor reboxetine protected them from vulnerability. And, indeed, this elegant research may explain why antidepressants that affect noradrenergic systems, such as mirtazapine (an alpha two receptor antagonist) and SNRI’s like venlafaxine, duloxetine and levomilnacipran may be more effective at improving social and work functioning in patients with depression. Isingrini E, Perret L, Rainer Q, Amilhon B, Guma E, Tanti A, Martin G, Robinson J, Moquin L, Marti F, Mechawar N, Williams S, Gratton A, Giros B. Resilience to chronic stress is mediated by noradrenergic regulation of dopamine neurons. Nat Neurosci. 2016 Feb 15. doi: 10.1038/nn.4245. [Epub ahead of print] PubMed PMID: 26878672.